Now they're getting out of there together. UPDATE: This mother and her babies are out of the shelter. 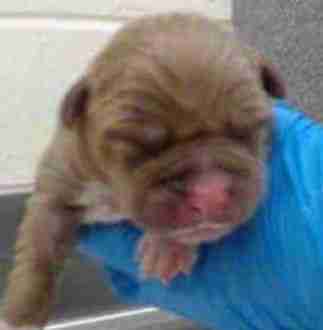 Members of Poochies Pet Rescue picked them up from Orange County Animal Services on Saturday. Here is a picture of them at their new foster home. 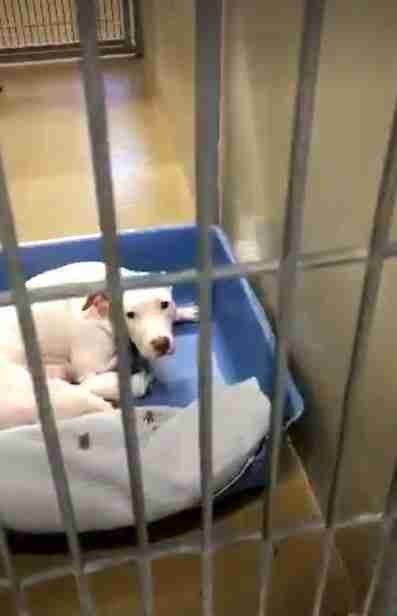 When Adrienne Andino visited the shelter in Orlando, Florida, she had just one dog on her mind. 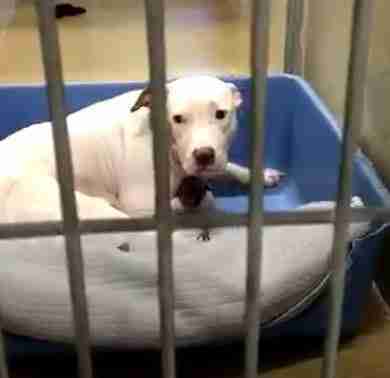 But when she left, it was another dog who ended up weighing heaviest on her heart. Andino, founder of Pitbull Tailz Rescue, was checking up on a dog in the isolation wing at Orange County Animal Services on Thursday. 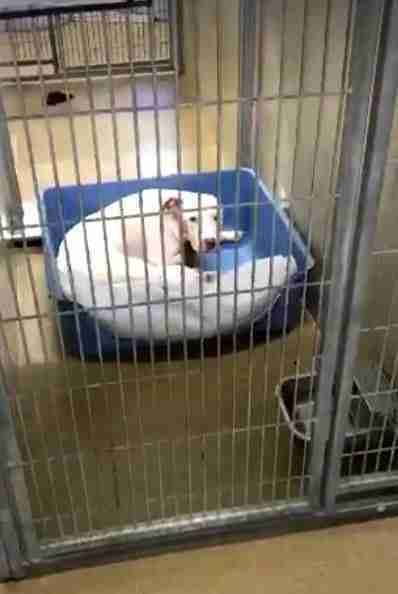 While she was there, though, she would check up on another dog in the same wing that some friends had asked her about. But when Andino peered into that dog's kennel, she realized there was nothing isolated about this dog at all. 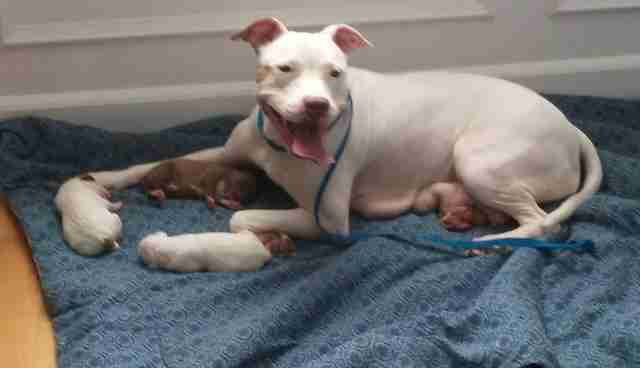 Rice Krispie, a 6-year-old pit bull mix, was clinging to a litter of newborn puppies. Like her life depended on it. And she wasn't wrong. Rice Krispie was surrendered to the shelter over the weekend. "She came in pregnant and gave birth while there," Andino tells The Dodo. "She was friendly. And they could handle her prior to her giving birth." Then something changed in Rice Krispie, who was still reeling from her sudden abandonment - an instinct to protect her babies in this strange, uncertain environment emerged. "She became a little bit aggressive," Andino explains. "That's not uncommon, especially in a shelter environment. Dogs are scared and protective." "They know what's going on for sure," Andino adds. "She knew what was happening and was scared and trying to protect her babies." 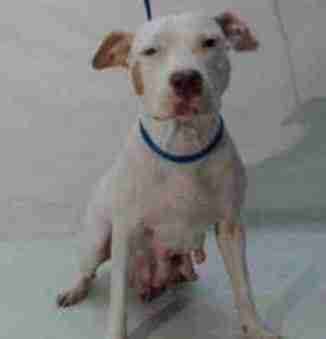 That aggressiveness earned Rice Krispie, along with her puppies, a kennel in isolation. From there, her next stop was likely to be the final one. And there was a chance her babies would also join her on the euthanasia list. "It doesn't happen often, but they do and they have and they will," Andino explains. "But usually a rescue will step up for puppies." Ironically, it was Rice Krispie's protectiveness over her babies that made their fate all the more uncertain. She wouldn't let anyone near them. "She was frightened and wanted to protect her babies," Andino says. "She was shaking. Visibly shaking." But when dogs can't leave the four walls of their kennel, a photograph can. Andino snapped pictures of this desperate mother on death row. They touched a chord on social media. 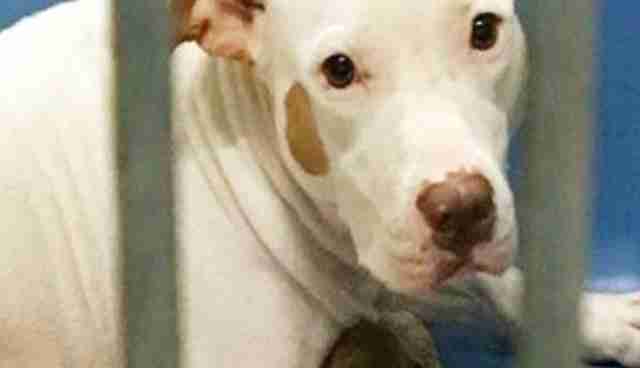 And less than a day later, a rescue group stepped up for Rice Krispie. She already has a new name - Scarlet. And on Saturday, thanks to a combined effort from Poochies Pet Rescue and the Central Florida Animal League, she will be leaving the shelter for good. And not a moment too soon. Just one more sleep, Scarlet. This new family already has a foster home waiting in Jacksonville, Florida. But if you would like to help support their journey in other ways, get in touch with Poochies Pet Rescue through the group's Facebook page.